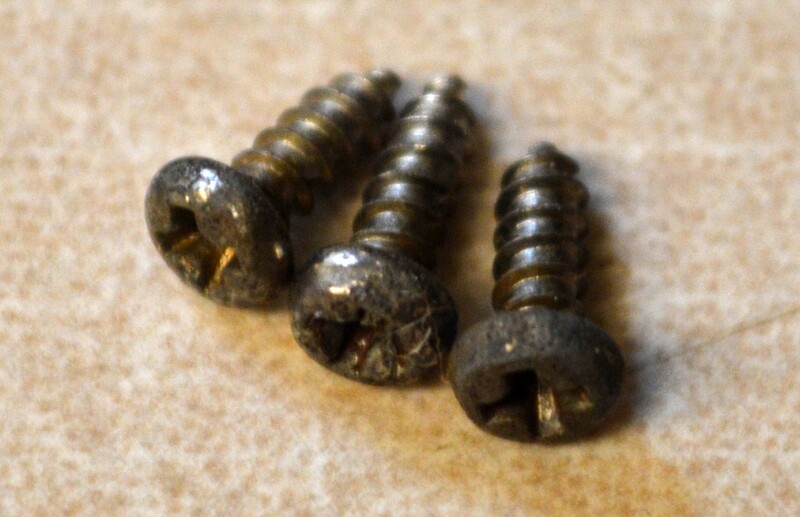 Airborne’s 30 year old screws have seen better days. I decided to carry out a little experiment. While putting Airborne back together again, I noticed something. 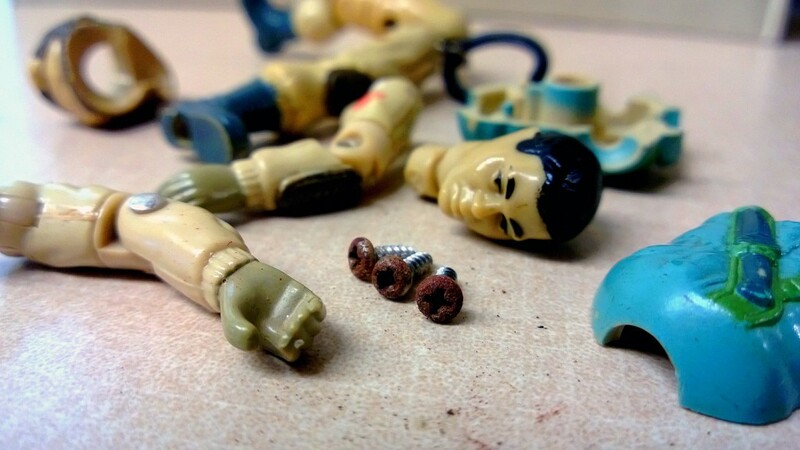 The screws in his legs, as well as the one in his back, were covered in rust. Upon removing them I discovered that while the threads were nice and clean, the heads were pretty bad. The one that had been in his back was especially discolored. I checked online for some possible remedies. A few came up, but the one that seemed to be the most straight forward was white vinegar. 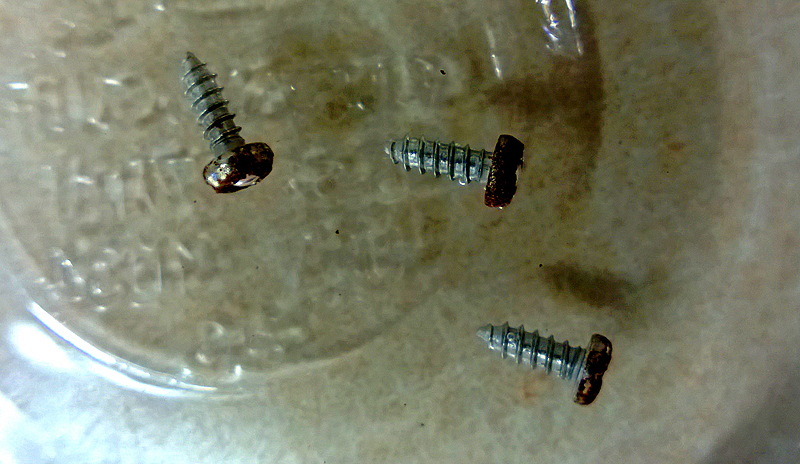 The rusty screws spent the night soaking completely in a dish of vinegar. The acidic, foul-smelling liquid is a natural cleanser. It’s regularly used to combat rust. I dropped the screws in and let them soak for several hours. I noticed the difference almost immediately. While it took nearly a day for the back screw to be cleaned, the two leg screws were ready to go after just a few hours. Wiping each of the screws with a paper towel, the rust was nearly all gone. There remains a little inside the screwdriver grooves, but they are much better than before. A little wear-and-tear remains, but that’s understandable after 30 years. After the vinegar treatment, these screws look good as new. For the most part my brother and I were generally kind to our G.I. Joes. We abused a few over the years, but we didn’t really frequently remove the screws or take them apart. As such they generally remained in good order and unfrayed. 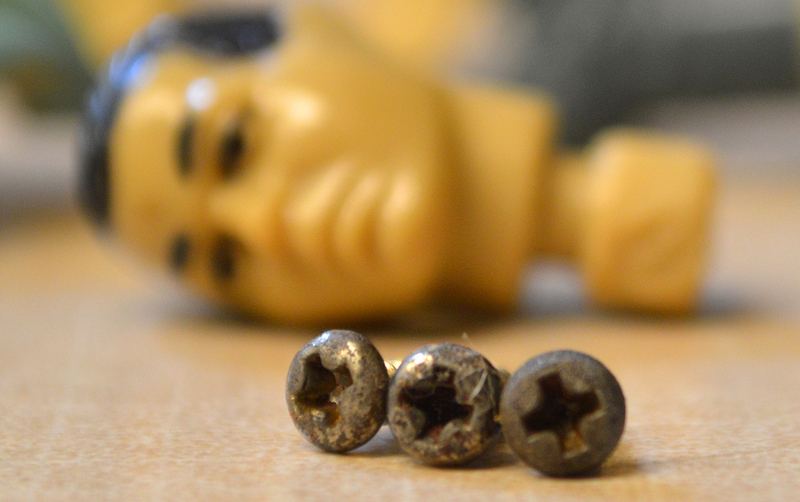 Some suffer rusty screws. Some of this is simple age, but they were played with in water, so that likely explains much of the rust. My plan is to use vinegar to give them a once over, and provide for a cleaner appearance. They still show their age, but lack of rust is a big improvement.